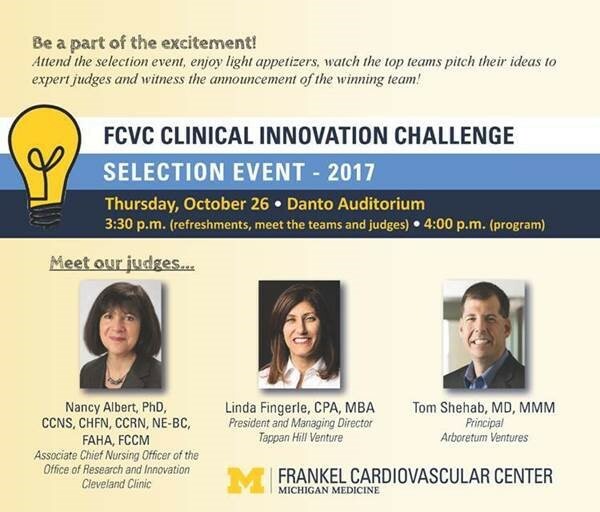 Michigan Medicine employees are invited to attend the CVC Clinical Innovation Challenge Selection Event, which will take place at 3:30 p.m. on Thursday, Oct. 26 in Danto Auditorium. 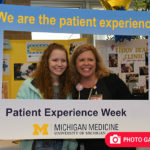 This “Shark Tank”-style event will highlight colleagues who will pitch their ideas on improving the value of patient care to expert judges and an audience of staff, faculty, trainees, patients and family members. Two prizes will be awarded, the Value Innovation Prize (sponsored by the Frankel Cardiovascular Center) and the Virtual Health Prize (sponsored by the Center for Health Communications Research). 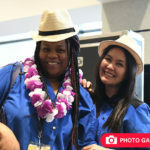 Both winners will receive $100,000 in funding and support to ensure success and follow-through. 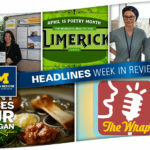 Plan to attend to learn about the inventive, forward-thinking work being done by coworkers at Michigan Medicine! If you can’t make it, the winner’s presentation will be livestreamed on the CVC Facebook page. For more on the CVC Clinical Innovation Challenge, click here.